I am REALLY excited to feature this book today on the blog. With its roots in actual Japanese history, THE WOMAN IN THE WHITE KIMONO has a deep, rich premise that I think will appeal to my readers who love the Japanese elements of my books. You’ll want to check this one out for sure! Although THE WOMAN IN THE WHITE KIMONO is a work of fiction, it is crafted from real events and stories, including my own—or rather, my father’s. The beginning was inspired by his story of the beautiful Japanese girl he loved while enlisted in the US Navy, and how her family had invited him to a traditional tea. Upon meeting him, an American sailor, he was refused. From there, research (and my imagination) took over. Over ten thousand babies were born to American servicemen and Japanese women before, during and after the Occupation. Ten thousand. Out of those, just over seven hundred children were surrendered to the Elizabeth Saunders Home—an orphanage in Oiso, Japan, created in 1948 by Miki Sawada, the Mitsubishi heiress, specifically for abandoned mixed-race children. By answering those questions, I was able to create a probable narrative, but it was in finding the real-life survivors—the children of the Elizabeth Sanders Home—and in learning their stories that The Woman in the White Kimono took on a story of its own. Although I set this novel aside several times, it called me back again and again. With knowledge comes responsibility, and since I knew—ten thousand babies—I bore a responsibility to share their story. It is my sincerest hope that The Woman in the White Kimono shines a bright light in multiple directions without blame or forced resolution. Wow, right? This book sounds amazing! I’m going to get a copy and read it right away as soon as it comes out. Thank you, Ana, for dropping by today and telling us about the historical roots of this novel! ​Japan, 1957. Seventeen-year-old Naoko Nakamura’s prearranged marriage would secure her family’s status in their traditional Japanese community, but Naoko has fallen for an American sailor, a gaijin. When she’s forced to make unimaginable choices, the consequences will ripple across generations. America, present day. Tori Kovac, caring for her dying father, finds a letter containing a shocking revelation—one that calls into question everything she understood about him, her family and herself. It would take a trip around the world to unravel her father’s past and an act of faith to face it. 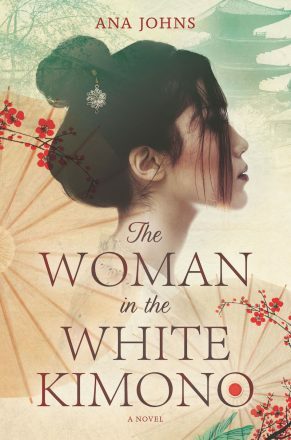 In breathtaking prose and inspired by true stories from a devastating and little-known era in Japanese and American history, The Woman in the White Kimono illuminates a searing portrait of one woman torn between her culture and her heart, and another woman on a journey to discover the true meaning of family.